It has been quite a treat to work with my friends at Empathinc. 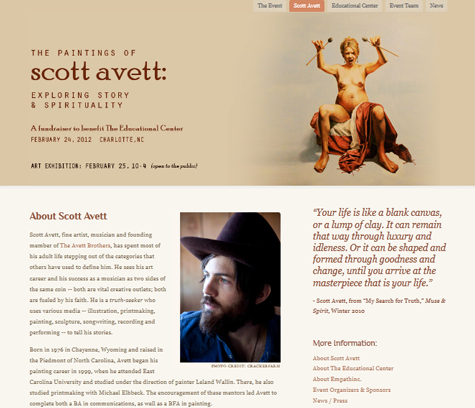 to plan an art show and fundraising event featuring artist Scott Avett. On Feb 24, 2012, Scott will speak about his art and spirituality at a private fundraising event for Educational Center and on Saturday, February 25 his work will be exhibited to the public. Working on a limited edition commemorative poster featuring one of Scott's linocut self-portraits -- more on that soon! More information on event can be found at artstoryspirit.com.